Approximately 25% of all patients with stage II colorectal cancer will experience recurrent disease and subsequently die within 5 years. MicroRNA-21 (miR-21) is upregulated in several cancer types and has been associated with survival in colon cancer. In the present study we developed a robust in situ hybridization assay using high-affinity Locked Nucleic Acid (LNA) probes that specifically detect miR-21 in formalin-fixed paraffin embedded (FFPE) tissue samples. The expression of miR-21 was analyzed by in situ hybridization on 130 stage II colon and 67 stage II rectal cancer specimens. The miR-21 signal was revealed as a blue chromogenic reaction, predominantly observed in fibroblast-like cells located in the stromal compartment of the tumors. The expression levels were measured using image analysis. The miR-21 signal was determined as the total blue area (TB), or the area fraction relative to the nuclear density (TBR) obtained using a red nuclear stain. High TBR (and TB) estimates of miR-21 expression correlated significantly with shorter disease-free survival (p = 0.004, HR = 1.28, 95% CI: 1.06–1.55) in the stage II colon cancer patient group, whereas no significant correlation with disease-free survival was observed in the stage II rectal cancer group. In multivariate analysis both TB and TBR estimates were independent of other clinical parameters (age, gender, total leukocyte count, K-RAS mutational status and MSI). We conclude that miR-21 is primarily a stromal microRNA, which when measured by image analysis identifies a subgroup of stage II colon cancer patients with short disease-free survival. The online version of this article (doi: 10.1007/s10585-010-9355-7) contains supplementary material, which is available to authorized users. Colorectal cancer (CRC) is the third most frequent cancer disease and the second most frequent cause of cancer related mortality in the Western World. There are approximately 600,000 new cases annually in these countries [1, 2]. In stage II CRC the tumor is confined to the bowel wall in contrast to stage III and IV, in which the tumors have disseminated to local lymph nodes and distant organs, respectively. Removal of primary stage II CRC is therefore intended to be curative; however, 20–25% of all stage II CRC patients will present with recurrent disease and subsequent death from the disease within 5 years after primary surgery. The majority of patients with stage II CRC do not receive adjuvant treatment since at present there is no evidence for a beneficial effect of systemic adjuvant treatment for this patient group as a whole . MicroRNAs (miRNAs) constitute a group of 18–22 base-pair long non-coding RNAs. Some miRNA genes, including miR-21, are transcribed as long non-coding RNAs with polyadenylation . miRNA biogenesis and activity is only partially understood, but a generally accepted sequence of steps is known as the “linear” canonical pathway . 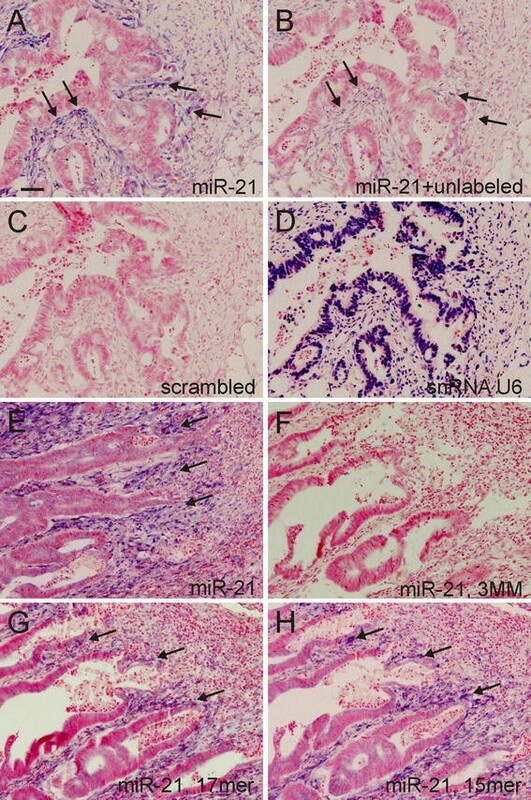 miR-21 is consistently upregulated in a variety of cancer tissues including colon [6, 7], esophagus , gastric , lung , and breast cancer [11, 12, 13, 14, 15]. The human miR-21 gene is located on chromosome 17q23-1 overlapping with the TMEM49 gene, a human homologue of rat Vacuole Membrane Protein 1 VMP-1 [4, 16]. miR-21 encodes a single hairpin and is regulated by its own promoter containing binding sites for AP-1 and PU.1 transcription factors . Several mRNAs have been identified as targets of miR-21 mediated regulation including PDCD4 [17, 18], SPRY1 and 2 [19, 20], NFI-B , RECK , and PTEN [22, 23, 24]. To better characterize the molecular pathways regulated by miR-21 in disease processes, determination of its cellular origin is crucial. In situ hybridization (ISH) analysis for miRNAs is a highly sensitive but technically challenging technology that is used to analyze miRNA localization and expression. The limited size of the miRNAs requires highly specific detection reagents. In studies of CRC tissues, ISH was utilized for cellular localization of miR-21, but they present diverging results. Schetter et al. found miR-21 staining of an epithelial colon cancer (CC) cell sub-population only, whereas Yamamichi et al. reported expression in both tumor cells and stromal fibroblasts. In a recent study that included CRC samples the miR-21 ISH signal was also seen in both tumor and stromal cells . In this study we have employed high affinity LNA-modified DNA probes together with a series of positive and negative control probes to show that miR-21 is predominantly located in stromal fibroblast-like cells within the tumor. We also developed an image analysis-based algorithm that allowed semi-quantitative assessment of the ISH signal in the clinical samples and show a significant correlation between high miR-21 levels and short disease-free survival in CC patients. This study included formalin-fixed paraffin embedded tumor specimens from 234 CRC patients [149 stage II (Dukes B) CC and 85 stage II rectal cancer (RC) patients], who were all part of the RANX05 study cohort . The original RANX05 study, approved according to the local scientific-ethics committee for Københavns and Frederiksberg Kommuner KF-200.2045/91, included 274 stage II CRC patients in the Danish cohort. Not all departments provided tissue samples, which resulted in 238 samples listed for the current study. Four samples were not available resulting in a total of 234 samples. Hematoxylin and eosin (H&E) staining was performed on all 234 samples, and we noted that seven samples (2 CC and 5 RC) did not contain cancer tissue and these were therefore not processed for the ISH analysis. The remaining 227 tumor specimens contained both normal mucosa and tumor tissue. Of these an additional 30 samples (17 colon and 13 rectal tumors) had either a small tumor area (<20 mm2) or experienced significant tissue damage or prevalent staining artifacts after ISH processing and were excluded in the statistical analysis. Patients within the RANX05 study underwent surgery for CRC during 1991–1993 and were followed for at least 60 months. None of the CC patients received adjuvant chemotherapy and none of the RC patients received radio- or chemotherapy. Patients who were categorized as having an event in the calculation of disease-free survival (DFS) experienced local tumor recurrence in the form of either local or distant metastasis, or death due to CRC, the latter obtained from the Danish Causes of Death Registry. Patients dying of all causes were considered as “death events” and were included as such in the overall survival (OS) analysis. Clinical data in addition to the follow-up data, included gender, age, differentiation grade (high, moderate or low), tumor type (adenocarcinomas, mucinous or signet ring carcinoma) according to the WHO classification, total leukocyte count , microsatellite instability (MSI) , and K-RAS mutation status. Differentiation grade, tumor type determination, MSI status and K-RAS mutation status were obtained for CC, only. DNA oligonucleotides with app. 30% Locked Nucleic Acid (LNA) substitutions  for full length miR-21 (the miRCURYTM probe, predicted Tm ~ 82.7°C, measured Tm ~ 83.7°C to miR-21 RNA target sequence): tcaacatcagtctgataagcta (Exiqon, Vedbaek, Denmark). Two additional oligos for miR-21 were designed including a 17-mer at the 5′-end (acatcagtctgataagc, predicted Tm ~ 82°C), and a 15-mer at the 3′-end (tcaacatcagtctga, predicted Tm ~ 81°C). In addition, we prepared a 22-mer probe containing three mis-matches (tcatcaacactctgataagcta, predicted Tm ~ 83°C to complementary RNA sequence, measured Tm ~ 61°C to miR-21 RNA sequence). A probe specific for U6 snRNA (cacgaatttgcgtgtcatcctt, predicted Tm ~ 84°C, Exiqon) was used as positive control, and a 22-mer scrambled probe with a random sequence (gtgtaacacgtctatacgccca, predicted Tm ~ 87°C) having no known complementary sequence target among human transcripts performing MegaBLAST search at NCBI GenBank, was included as negative control. All LNA oligos were digoxigenin (DIG)-labeled at the 5′- and 3′-ends except the U6 probe, which was only 5′-end labeled, or if otherwise specified. Six μm-thick paraffin sections were mounted on Super frost + glass slides and deparaffinized. The slides were mounted onto flow through slide chambers and placed in a Tecan Freedom Evo automated hybridization instrument (Tecan, Männedorf, Switzerland) in which the following steps were performed: proteinase-K treatment 15 μg/ml at 37°C for 8 min, pre-hybridization in Exiqon hybridization buffer (Exiqon, Vedbæk, Denmark) at 62°C for 15 min, hybridization with 40 nM miR-21 probe, stringent washes with 5 × SSC, 1 × SSC and 0.2 × SSC buffers at 62°C over 33 min, DIG blocking reagent (Roche, Mannheim, Germany) in maleic acid buffer containing 2% sheep serum at 30°C for 15 min, alkaline phosphatase-conjugated anti-digoxigenin (diluted 1:500 in blocking reagent, Roche) at 30°C for 30 min, enzymatic development using 4-nitro-blue tetrazolium (NBT) and 5-brom-4-chloro-3′-Indolylphosphate (BCIP) substrate (Roche) forming dark-blue NBT-formazan precipitate at 30°C for 60 min, nuclear fast red counterstain (Vector Laboratories, Burlingname, CA), at 25°C for 1 min. The slides were then dismantled in water, dehydrated in alcohol solutions and mounted with eukitt mounting medium (VWR, Herlev, Denmark). For each patient, two slides were hybridized with the full length miR-21 probe. To minimize day–day variations all probes were pre-diluted in hybridization buffer in quantities determined for a single experiment. The same proteinase-K stock was used through-out the experimental period. The following steps were standardized in all steps on different experimental days: tissue sectioning at 6 μm, incubation times, incubation temperatures, pre-diluted probes, antibody dilutions, proteinase-K batch. For probe specificity analysis the full length miR-21 probe was replaced with the 5′-end probe, 3′-end probe, 3-mismatch probe, scrambled probe (all at 40 nM), or the probe for U6 snRNA (0.1 nM). For fluorescent ISH, the sections were processed as above, except that detection of the DIG-labeled probes was done with peroxidase-conjugated sheep anti-DIG (Roche) followed by TSA-FITC substrate (Invitrogen, Taastrup, Denmark) according to manufacturer’s recommendations. Slides were coverslipped using DAPI mounting media (Invitrogen). For image analysis we used the Visiopharm integrated microscope and software module (Visiopharm, Hørsholm, Denmark), comprising a Leica DM 6000B microscope (Leica, Herlev, Denmark) equipped with an automated stage and slide loader (Ludl, Hawthorne, USA) and an Olympus DP72 CCD camera. Overview images of tissue sections were captured using a 1.25× objective. The tumor area (20–40 mm2) was encircled on the overview images in which 8–17 random image fields were collected using systematic uniform random area sampling. The sample images were captured with a 20× objective covering 0.29 mm2 each. Exposure of sample images was strictly controlled and locked at 6.993 ms with RGB (red–green–blue) values at 170–180 in non-stained blank areas. Sample images with tissue and staining artifacts were excluded. All sample images included contained areas with evident cancer cells and tumor stroma. Sample image exclusion was done by an observer (BSN) unaware of the clinical parameters. We employed supervised segmentation based on Bayesian classification using the Visiomorph software tool. For miR-21 quantification, the following histologically stained structures were differentiated: blue areas (B) corresponding to the hybridization signal, red area (R) corresponding to the red nuclear stain, purple areas (P) corresponding to blue ISH signal overlaying nuclear red stain. In addition, mucinous secretion stained with NFR (mostly observed within normal mucosa and only sporadically appearing in cancer areas) could be discriminated and was considered as background signal. The following parameters were obtained for each sample image: B, R, P, total blue (TB = B + P), total red (TR = R + P), as well as TBR = TB/TR. Minimal (less than 1%) mis-classification of the blue signal and no mis-classification with the red signal was observed when applying the pixel classifier to NFR stained sections with no NBT-formazan development and to NBT-BCIP stained sections with no NFR counter stain indicating that the classifier efficiently discriminated the blue NBT-formazan precipitate from the NFR stained nuclei (data not shown). Three parameters obtained from image analysis and reflecting relative miR-21 expression levels were considered: (1) the stained area, (2) the staining intensity and (3) the number of positive cells. Since the stromal cells were often overlapping we did not pursue a model based on numbers of positive cells. In our image analysis set-up we evaluated a measure of ISH signal intensity within the whole image field. These intensity values did not vary much and combining the intensity parameter with area measures did not improve the correlation of the area measure to survival. For determination of the intra-assay variation, we captured random images (n = 7) from six random slides three times. For these six slides, the average CV was found to be 94% for TBR and 84% for the TB value, thus the same range as the inter-slide variation that for all 197 cases were 67 and 71%, respectively (see p. 14). 5 μm-thick paraffin sections were fixed on PEN membrane frame slides (Molecular Devices, Sunnyvale, CA) and stained with Hematoxylin and Eosin. Tissue fractions (50–200 × 103 μm2) of normal adjacent mucosa, tumor stroma, and cancer cells were isolated into separate CapSure® Macro LCM Caps (Molecular Devices) using an Arcturus Veritas Laser Capture Microdissection System (Molecular Devices). RNA was purified using the FFPE miRNeasy kit (Qiagen, Valencia, CA). RT-qPCR was performed using the miRCURY LNA™ Universal RT microRNA PCR system (Exiqon) on a Lightcycler-480 (Roche). Quantification cycle (Cq) was calculated using the 2nd derivative method. Melting curve analysis was performed to verify amplification of single PCR products. MSI was determined in DNA purified from 10 μm-thick paraffin sections by PCR for five markers as described . Patients with MSI score 3–5 were considered MSI-positive. K-RAS mutational status (wild type vs. mutation) was determined on the purified DNA obtained for the MSI analysis (above) using the Therascreen K-RAS mutation qPCR kit (Qiagen/DxS, Manchester, UK) according to manufacturer’s instructions. The qPCR analysis detects the presence of 7 K-RAS mutations: Gly12Asp (GGT > GAT), Gly12Ala (GGT > GCT), Gly12Val (GGT > GTT), Gly12Ser (GGT > AGT), Gly12Arg (GGT > CGT), Gly12Cys (GGT > TGT), and Gly13Asp (GGC > GAC). The presence of one or more of these mutations categorized the patient as positive in K-RAS mutational status. All statistical calculations were performed using SAS (version 9.1). The level of significance was set to 5%. Variance components for the estimation of intra-individual variance and the inter-individual variance were done and the results presented by the coefficient of variation (CV) and the intra-class correlation coefficients (ICC). The Wilcoxon rank sum test was used to test for differences in levels between cases clinical parameters. DFS analysis was done using the Cox proportional hazards model and defined as local recurrence, distant metastases or death attributable to CRC (primary cause). Overall survival (OS) was defined as death due to any cause. Age and gender were included as baseline covariates. All analyses were stratified by localization. The miR-21 values (TB or TBR) were analyzed as continuous variables on the log scale (base 2). The estimated HR values are therefore representing a 2-fold increase in the miR-21 values. Model validation has been done for the proportional hazards assumption and linearity of the covariates. Kaplan–Meier estimates of DFS are presented with patients grouped by the tertiles of the miR-21 values with differences between strata tested using the log-rank statistic. The assumption of linearity and the proportional hazards assumption were assessed using Schoenfeld and martingale residuals. For specific identification of miR-21 in tissue sections using ISH, we employed high-affinity LNA-containing DNA oligos labeled at both the 5′- and 3′-ends with DIG. Various hybridization conditions, including tissue pre-digestion, probe concentrations and hybridization temperature were analyzed. Under optimized conditions (see material and methods) we observed strong signal with the double-DIG-labeled miR-21 probe in parallel with little or no background stain, and no signal with the double-DIG-labeled scrambled probe (Fig. 1a, c). Mix-incubating the miR-21 probe with a 2-fold excess of un-labeled probe during hybridization or pre-incubating tissue sections with un-labeled miR-21 probe resulted in a strong reduction in the ISH signal (Fig. 1b). ISH signal for snRNA U6 was observed in the nuclei of all cell types (Fig. 1d). Two alternative LNA oligos specific for the miR-21 sequence (17-mer and a 15-mer) showed an ISH pattern identical to the 22-mer full-length probe, whereas a 22-mer miR-21 probe containing three mis-matches showed no staining (Fig. 1e–h). The miR-21 signal was predominantly observed in the stromal compartment of the CRC (Figs. 1, 2a, b, 4). The intensity varied from case to case and locally within the lesions (Fig. 1a), although there was generally an abrupt decrease of expression at the invasive front. Some cases, approximately 20% (4/22), showed focal expression in cancer cells as clusters within central tumor areas (Fig. 2b, d) or in the tumor periphery (Fig. 2c). Only one case (out of the total of 197 CRC cases) showed predominant miR-21 expression in the cancer cells (data not shown), this patient did not experience recurrent disease within the follow-up period. Smooth muscle cells of muscularis externa often showed miR-21 expression where the cancer was invading (Fig. 2e), whereas the layer of external smooth muscle under the normal mucosa was miR-21 negative (data not shown). We did not observe any obvious differences in miR-21 expression pattern comparing CC and RC. The miR-21 expression pattern was characterized by intense expression in the tumor area in contrast to the normal mucosa, where weakly stained spherical mononuclear cells were occasionally observed (Fig. 2f). Intense miR-21 ISH signal was also observed in the stromal compartment using fluorescence detection (data not shown). Comparative RT-qPCR was performed on laser capture microdissected colon cancer samples. The levels of miRNA-21 were normalized to the levels of miR-103 and let-7a, which by genome-wide analysis were identified among the most stably expressed miRNAs in these samples. The tumor stromal cells demonstrated 6-fold higher levels (p < 0.001) of miR-21 than the cancer cells or normal colon tissue (Fig. 3). We measured an app 2-fold increased expression (p < 0.05) in the cancer cell population compared to normal colon tissue. Although this may be explained by minor contamination of miR-21 from adjacent stromal cells, it may also reflect discrete miR-21 expression in cancer cells. Using the optimized ISH conditions, we analyzed the 130 CC and 67 RC cases for the expression of miR-21. Automated ISH allowed uniform incubations across all samples and was used to process two slides from each case for miR-21 expression analysis. Since the expression of miR-21 varied considerably within tumors a total of 13 random image fields (median = 13, range 9–33) placed within the tumor area (Fig. 4a) were acquired per patient for subsequent image analysis. Because the expression of miR-21 varied according to the number (and density) of positive cells we made the simple assumption that the area covered by the blue ISH signal corresponded to the relative miR-21 expression level. Thus, based on a Bayesian pixel classifier we determined the area of the blue ISH signal, termed B (Fig. 4b, c). We also determined the area of the nuclear red stain (R), as well as the purple area (P) representing the blue ISH signal overlapping with nuclear red (Fig. 4d, e). The following area parameters were obtained: B, R, P, TB (B + P), TR (R + P), and TBR (TB/TR), of which TB and TBR were included in the statistical analyses. Both TB and TBR values represent a relative miR-21 expression level, of which TBR represents values normalized to the nuclear density. Focal expression of miR-21 throughout tumor areas together with random positioning of image fields caused a considerable variation within slides (125%). However, the precision of the average measures was sufficiently high, giving CV = 67% for TBR values and CV = 71% for TB values within individuals, in comparison with the CVs between individuals, which were 245 and 275%, respectively. The calculated ICCs (the variation for individuals versus the entire variation) were 84% for both TBR and TB values. The descriptive statistics for the miR-21 quantifications in the CC and RC groups are shown in Table S1. The miR-21 expression levels, measured as TB or TBR values, were similar in the CC and RC patient groups. Comparison with other clinical parameters showed that the male patient group had significantly higher TBR values than the females (Table 1). However, this difference was not supported by the TB values (Table S2). None of the other clinical parameters (age, grade, type, total leukocyte count, MSI, K-RAS) revealed any correlation with miR-21 expression levels measured as TBR and TB values. For the patient cohort, the median follow-up time was at least 60 months and the number of relapses was 34 and 29, the number of deaths 62 and 34 among the CC and RC patients, respectively. The CC patients with high miR-21 expression levels (TBR, log2-transformed values) had significantly shorter DFS (HR = 1.28, 95% CI: 1.06–1.55, p = 0.004) and a higher overall death rate (OS, HR = 1.17, 95% CI: 1.02–1.34, p = 0.03). Kaplan–Meier estimates of DFS probabilities for TBR are shown in Fig. 4f, g and for the TB values shown in Fig. S1A. The Kaplan–Meier estimates for TBR (Fig. 4f) and TB values (Fig. S1A) are virtually identical. Considering DFS, the 33% patients with the highest miR-21 TBR-levels, 73% (95% CI: 60–87%) were alive 2 years after surgery, whereas the same rate was 98% (95% CI: 93–100) among the patient tertile with the lowest miR-21 levels. For the middle tertile this number was 86% (95% CI: 75–965). The Kaplan–Meier estimate of the TBR-levels using the 65th percentile as cut-point (corresponding to an expected recurrence rate of 25% adding a 10% margin) is shown in Fig. 4g, and results in a HR of 2.39 (95% CI: 1.22–4.69) for the high-risk population. Correlation between miR-21 levels and DFS or OS was not observed in the RC group (DFS, HR = 0.96, 95% CI: 0.81–1.15, p = 0.67 and OS, HR = 0.97, 95% CI: 0.83–1.13, p = 0.71), Fig. S1B, S1C. Multivariate Cox regression analyses of the DFS data were performed to compare the statistical power of the measured miR-21 expression levels, TBR and TB, and their potential correlations to gender, age and total leukocyte count. Both TB and TBR values were found to be independent predictors of DFS in the CC patient group (p < 0.05), Table 2. Including the other clinical parameters (differentiation grade, tumor type, K-RAS and MSI) in a multivariate model with TBR (CC) resulted in p = 0.66, p = 0.71, p = 0.70, p = 0.16, respectively. In the present study we show that a high expression level of miR-21 measured by quantitation of chromogenic ISH signal is associated with short DFS and OS in stage II CC patients. The relative miR-21 expression estimates were found to be independent of other clinical parameters including age, gender, K-RAS and MSI status. We found an intense and well-defined miR-21 ISH signal in the stromal compartment of the tumors using three distinct high affinity antisense LNA probes against the mature miRNA. This localization was supported by RT-qPCR analysis of LCM tissue compartments identifying a 6-fold higher miR-21 level in the stromal compartment compared to that in the cancer cell compartments. The formation of ISH signal was strongly reduced by mix-incubating excess un-labeled probe with the DIG-labeled miR-21 probe on the tissue sections. In addition, no specific ISH signal was observed with two negative control DIG-labeled oligos, one similar to the full-length miR-21 oligo but containing three mis-matches and one with a scrambled sequence. Based on these specificity tests, we conclude that the ISH signal observed represented the presence of genuine miR-21. Taken together, our findings suggest that miR-21 derived from the stromal cell population contributes to the hostile malignant properties of the primary CCs. The stromal miR-21 positive cells observed in the CRC were generally fibroblast-like in morphology. Cancer associated fibroblasts constitute a heterogeneous cell population with significant growth-promoting impact on tumor progression [32, 33]. 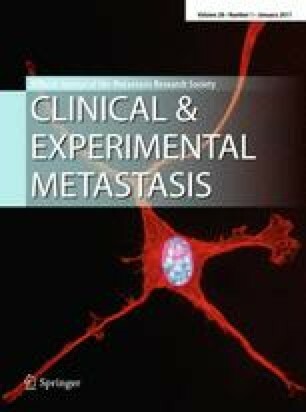 Most cancer-associated fibroblasts are myo-differentiated so-called myofibroblasts that may derive from one or more local cell populations like pericryptal myofibroblasts, quiescent interstitial fibroblasts, smooth muscle cells, circulating fibrocytes, and/or by epithelial-to-mesenchymal transition (EMT) [34, 35, 36]. Fibroblasts may act on tumor cells through expression of growth factors, such as TGF-β, and thereby contribute to the survival and proliferation of tumor cells . In addition, a number of extracellular proteases are expressed in myofibroblasts, facilitating tissue remodeling and growth factor activation during tumor growth, for example, well-established prognostic cancer biomarkers like uPA and PAI-1 as well as TIMP-1 and MMP-2 are primarily expressed in cancer associated myofibroblasts [37, 38]. Sempere et al. included CC samples in their study and also found miR-21 signal in both tumor cells and tumor associated fibroblast using a double fluorescence approach. A prevalent expression of miR-21 in CRC stroma was not reported by Schetter et al. who found discrete ISH signals in the tumor area and described the miR-21 positive cells as tumor cells. Yamamichi et al. used an FITC-labeled LNA oligo and TSA-based amplification and found expression of miR-21 ISH signal primarily in cancer cells but also reported stroma cell expression. The reason for these discrepancies is likely explained by cross-reaction of the oligo to “similar sequences” allowed under suboptimal hybridization conditions. Another possible reason for the discrepancy is linked to the different reagents employed to detect the labeled LNA oligo. It should be noted that in the latter two studies [7, 16] only the scrambled probe was included to support the specificity of the ISH signal observed. For our study we developed a novel ISH procedure for LNA-based miRNA ISH considering procedures described by others [39, 40, 41], but suitable for an automated set-up using a Genepaint instrument . We recently established a manual ISH procedure and confirmed the expression pattern for miR-21 as well as for a number of other miRNAs in various tissues . For semiquantitative analysis, we employed an unbiased image sampling and analysis approach to replace the manual and more subjective scoring of the histological expression intensities. Using image analysis we obtained quantitative estimates of the ISH signal for miR-21 (TB) as well as the area ratio to the nuclear density (TBR). Both estimates showed that the high levels correlated significantly to short DFS in the CC patient group of which the TBR values provided the best correlation. Adjusting the ISH signal to the cell density provided a lower inter slide variation and may therefore explain the slightly better correlation obtained for TBR. The precision of the TBR and TB estimates for each patient was fairly high compared to the variation among individuals. For both TBR and TB estimates, we obtained high ICC values, 84% for both TBR and TB, confirming that the inter-individual variation was substantially larger than the intra-individual variation and a good indication that the two parameters could be significant biomarkers. The significant correlation of miR-21 to DFS and OS may prove useful for future development of tests to identify stage II CC patients at risk of disease recurrence. In this study we found that miR-21 correlation to CC DFS was independent of other clinical parameters available for some or all of the patients. Thus, none of the parameters available (including age, gender, total leukocyte count, K-RAS or MSI) for the CC patient group (alone or in combination) correlated with DFS or miR-21 ISH levels. A significant correlation between high miR-21 levels and poor survival in CC patients has also been reported by Schetter et al. These authors isolated RNA from normal tissue and CC tissue from 52 stage II patients and obtained cancer/normal ratios of miR-21 by qPCR. Recently, Schetter et al. found that combining the miR-21 levels with a mRNA expression score for inflammation (Il-6, IL-8, IL10, IL-12a and NOS2a) allowed an even better prognostication of high risk CC patients . This is an interesting observation, which in addition to enforcing the prognostic value of miR-21, also suggests that the molecular profile of the inflammatory response in CC better reflects the risk than the total leukocyte count available in our patient cohort. Increased miR-21 levels measured by either microarray or qPCR have been shown to correlate with poor prognosis in several other cancer types including NSCLC , breast cancer [11, 12], and head-and-neck cancer [44, 45]. It has been demonstrated that the cellular origin of miR-21 is also partly stromal in breast  and lung cancers . All these data further demonstrate miR-21 as an inherent cancer associated miRNA with a significant impact on tumor growth and dissemination. Our quantitative measurements of the miR-21 ISH signal identified a significant correlation to DFS in CC patients but not in the RC group. This could be a result of surgical intervention being different or due to different molecular pathways for cancer invasion and dissemination in the two parts of the intestines. The RC patients included in the present study were all operated before the introduction of the TME (Total Mesorectal Excision) operational procedure . The TME practice is associated with a significantly longer DFS probably due to excision of more malignant tissue and/or lymph nodes . Thus, the surgical procedure of the RC patients in this study is a likely confounding parameter that may have prevented the detection of relations between biological events (here miR-21) and disease progression. It cannot be excluded, however, that also other molecular pathways being specific for the RC could contribute to the observed lack of a significant association between miR-21 and DFS in the RC patients. The miR-21 promoter contains putative binding sites for AP-1, Ets/PU.1, C/EBPα, NFI, SRF, p53, and STAT3 . Activation of the ERK-MAP kinase pathway, induced for example by TGF-β, leads to AP-1 activation and has been found to be augmented by miR-21 in cardiac fibroblasts . TGF-β is expressed at high levels in CRC and induces fibroblast activation and differentiation into myofibroblasts in model systems  as well as in CRC tissue  where most fibroblasts are myofibroblasts. The mechanism(s) of action of miR-21 in cancer fibroblasts is not known. In various settings, miR-21 has been reported to affect expression of the transcription factor NF1-B in PMA-stimulated HL60 cells , Spry1 in cardiac fibroblasts , the tumor suppressor PTEN in hepatocytes and cardiac fibroblasts [22, 23], and the tumor suppressor PDCD4 in a variety of cell lines [17, 51]. The identified mRNA targets vary according to the particular cell line being analyzed. We have demonstrated that the prevalent expression of miR-21 in the stromal compartment of CC patients is correlated with short DFS and shorter OS. However, it remains unsolved how the miR-21 positive stromal cells contribute to the malignant characteristics of these tumors and whether the sporadic miR-21 positive epithelial cancer cells are also important. If the stromal cell population is directing tumor progression, how do we then explain the recurrent disease after tumor excision? Is the submucosa already primed for promoting local re-growth or are potential metastatic sites already primed for stimulating growth of un-detected micro-metastases? In this context, the miRNAs are truly playing the role as molecular regulators critical to disease progression. Such central roles in cancer have led miRNAs to be considered attractive novel therapeutic cancer targets, both for inhibiting oncogenic miRNAs or by re-introducing miRNAs lost in cancer . To this end, recently it has been demonstrated that miR-21 is strongly upregulated in cardiac fibroblasts in a murine heart failure model and that silencing the fibroblast-derived miR-21 using miR-21 antagonists can prevent or even cure the functional deterioration . We thank Heidi Solvang Christensen (Exiqon) for excellent technical assistance, Jesper Salomon (Exiqon) for designing the LNA oligos, Torsten Bryld (Exiqon) for the Tm analyses, Dr.Martin Højgaard (Department of Urology, Herlev Hospital) for giving access to the LCM facility, and Lars Pedersen (Visiopharm) for advice in image analyses. NB was supported by the Danish Council for Strategic Research (FØSU).